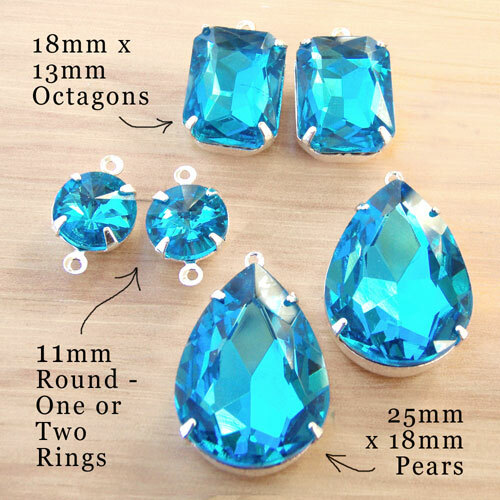 This post is just bragging – I’ve recently gotten some more aqua glass jewels and I’m just in love with this color. Call it aqua – or turquoise – it’s gorgeous! Yes, these are all available in my Etsy online store. I’ve got more than just the ones shown in the pic above – but I have to say, these are among my favorites. The color is probably the most universally flattering jewel you can find (okay, except real, large-carat diamonds, and if you can afford those it doesn’t matter what color your clothing is). And it looks good year-round: turquoise and a summer tan? Winner. Turquoise with black and white, or tan and cream, in winter? Bingo. Win-win. 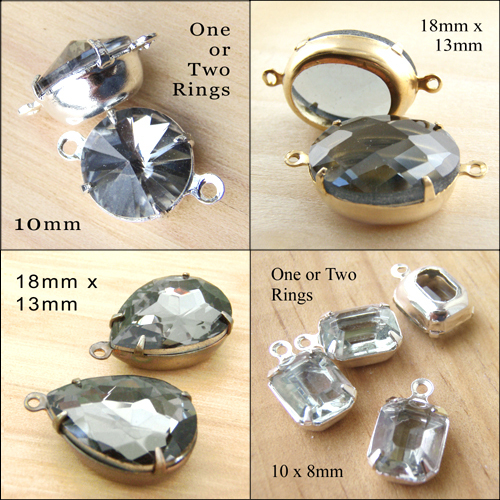 Aren’t these pieces wonderful? I love the detailing with the coordinated fabrics, the serged finish on each swatch of fabric, and the skill she’s used in building these pieces. And of course, there’s the all-important fact that she’s designed and made these with fabrics and garments that were discarded throwaways. Like I said – it take an artist to see the beauty and create these. The artist is Susan Temple of MargoSue Studio on Etsy. She’s got some great work in her shop – and her prices are so reasonable it’s almost scandalous. Go shopping! P.S. 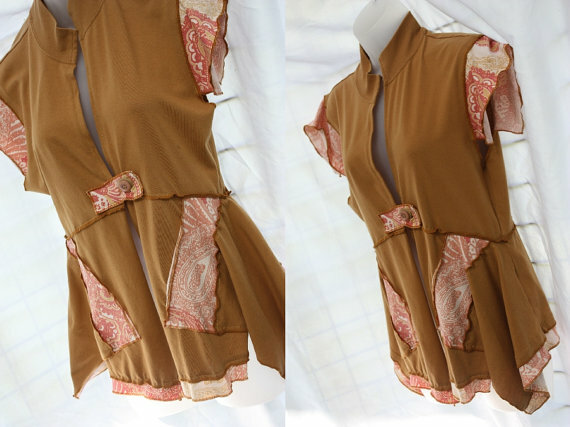 Note for people who don’t sew – no, it is not easier to build new garments from upcycled fabrics or garments. It takes more skill, not less! Take it from someone who does sew. I appreciate this work! Don’t get me wrong, I love color. Vibrant, rich, happy color can totally brighten your day. But sometimes, you want a neutral. It goes with practically everything. It quietly announces This is Classy. Neutral gemstones or glass gems or beads are the Angela Bassett or Lauren Bacall of jewelry – they always look good, they’re always in style, and they’re always a Class Act. And by the way, wasn’t it smart marketing, when somebody came up with THAT name for this neutral gray stone? Just for fun – feel like a 1950s mom! 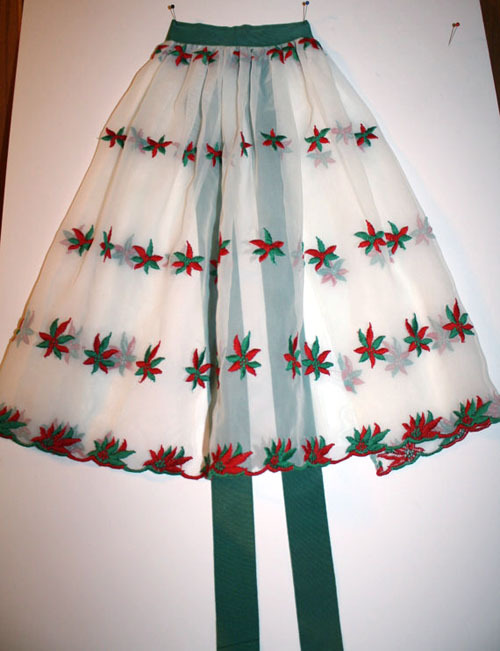 I found an adorable, genuine 1950s Christmas apron complete with poinsettias – which is cute and funky and wouldn’t it be more fun to cook in this apron? I mean, if you’re going to do it, you might as well feel all Mom Cleaver, right? This darling apron is available at A Blast 2 the Past – a great vintage shop on Etsy. The shop owner, Cathy, obviously appreciates the fun image of TV moms – that’s her cool pic above! 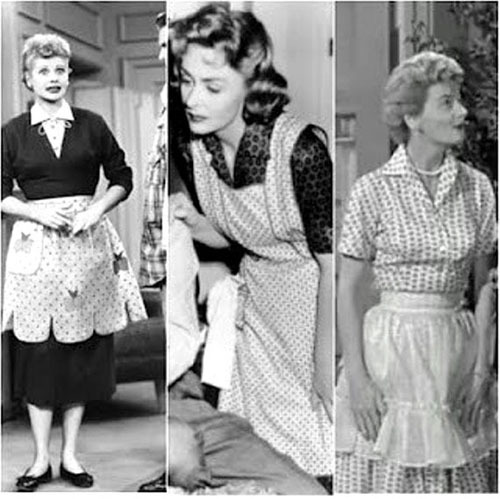 I mean, who wouldn’t like to role-play (a little bit anyway) and be Lucille Ball, Donna Reed, or Barbara Billingsley? And then go back to real life and take-out, maybe. But still! P.S. And what a great gift for your mom! P.P.S. And if this particular apron is gone when you visit her shop – believe me, she’s got some great finds there. You’ll love it! Purple Fish Studio (love that name) really did ask me questions, and like that. You can find the interview here. And hey, check out some of her other fun posts, like How to make a Found Object Leather Bangle and Silver Swirls and Pearls. 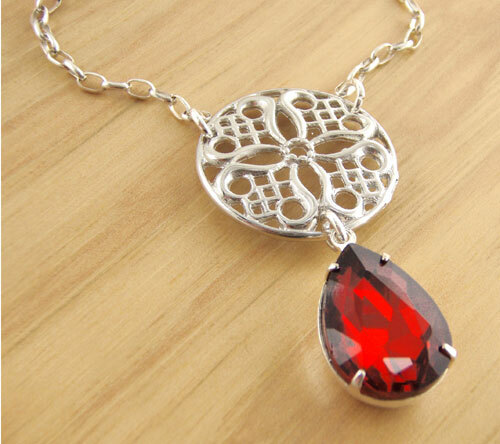 Here’s another quick, easy necklace design idea. Take one pretty pendant – and add an ornament. Voila: a terrific concept that you can adapt to endless designs. In one design, I’ve shown a circular ornament, almost modern in design, paired with a very traditional ruby glass teardrop pendant. 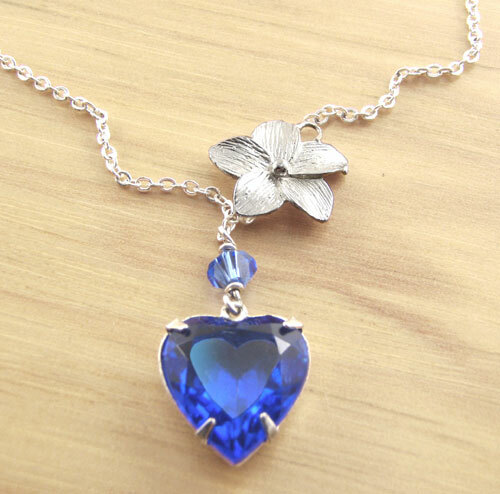 In the other, a vintage sapphire heart jewel is added to an asymetrical silver flower charm. You see what I mean – incorporating an extra ornament, a small cluster or charm, adds dimension and texture. It doesn’t have to be complex. It just has to be fun or pretty or interesting. You choose. It’s your design. 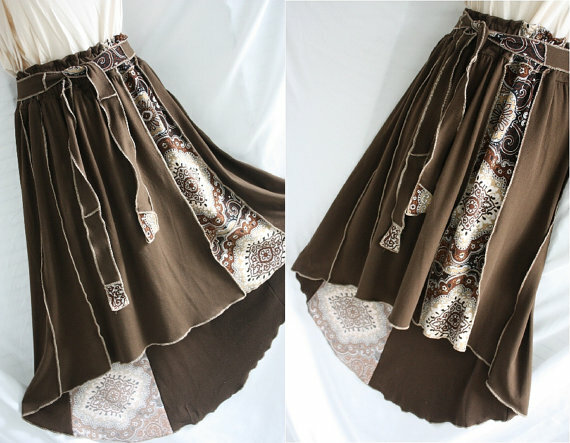 I know the minute you see this skirt you’re going to think the same thing I did: this is a GREAT skirt! Is that not fabulous? It’s available from McGregorGirl Vintage on Etsy and I have to say, she has some fabulous items – and very affordable fabulous items. Her shop is going on my favorites list! P.S. I included the second pic here because I love the whole outfit. The shoes, the top, the glasses… and oh yes, the gloves! This is a girl who knows how to present her vintage items. She stages well. She has good feedback. She has great pricing. This is a shop to remember!